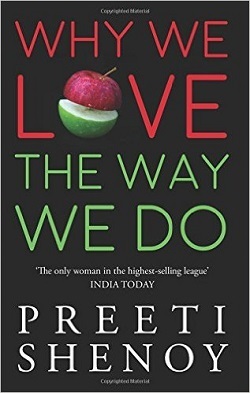 Preeti Shenoy who belongs to one of the highest selling authors of the present times has come out with a book on ‘Love and relationships’. The topic should be interesting automatically but, it is a non fiction. The book discusses a variety of topics related to ‘love’ mostly aimed at to gen Y than others through a series of articles. The book carries right from the time one ‘finds the one’ to what are the complexities of things that could happen’between the sheets’. The book quite outspoken, and projects on things like ‘getting hitched’, ‘when things go wrong’, ‘on men and women’, and some of the very pertinent topics for the present youngsters like the physical and emotional problems they face in man-woman relationships quite candidly. The book, however, doesn’t indulge in preaching but rather thinking loudly and more objectively on the problems prop up in man woman relationships. She not just articulates on her views with real life examples, but also refers many books and movies where relationships have been projected in different shades. These are not just western movies but Indian movies too like ‘Cheeni Kum’ where an old man and a middle aged woman falling in love to ‘Kabi Alivida Na Kehna’ were adultery has been dealt with in detail. The book is quite informative to persons like me who are not too familiar with foreign movies, books and many authors. Shenoy’s simple prose makes an interesting reading. However, human relationships are the most complex quality to analyze and conclude. She also touches upon this fact at the end of each article in someway or other. Interestingly, the articles do not run to several pages and brevity is one of the important favorable aspects of the book.